Canada’s Indigenous peoples had the acknowledgment of their Aboriginal rights at different times. In 1867, the federal government only recognized “Status” First Nations as being under its jurisdiction. The British North America Act made the federal government responsible for the First Nations or “Indians” as they were once called. “Enfranchised” Indians lost their status and became “citizens” like Euro-Canadians, and they lost their Indigenous rights, becoming non-status Indians. This form of state responsibility is known as jurisdiction. In 1939, the Supreme Court of Canada ruled that the Inuit were also “Indians” in the constitutional sense. The Inuit then fell under federal jurisdiction. The Métis were not recognized as an Indigenous people even though the Manitoba Act indicated that the Métis were Indigenous and the Métis were to have their Indigenous rights recognized through a land grant. Scrip was implemented as a means to deal with their Indigenous title to the land following the Manitoba Act. For many years, the Métis were caught in a jurisdictional limbo — neither the federal government nor the provinces claimed them as their responsibility. Like other Indigenous Peoples, the Métis were marginalized and faced the same colonization as First Nations and Inuit, including racism, social displacement and economic marginalization. The only difference was that the Métis had more freedom of movement and were not consigned to reserves. Not having their Indigenous rights enshrined in the Canadian Constitution has been a contentious issue for Métis activists since the 1930s. During the late 1970s, Prime Minister Pierre Trudeau announced that he was going to patriate the Canadian Constitution, which was then still an act of the British Parliament. In response, Indigenous groups across the country began a campaign to ensure that they were included in the new Constitution. They wanted to move past the colonialist “two nations” English-French compact theory of Confederation and to enshrine and affirm the rights of Indigenous Peoples in the new Constitution. What followed was a series of first ministers’ conferences, which Indigenous leaders were not initially invited or consulted. Eventually, Indigenous leaders were invited to participate in the meetings, but only those relating to Indigenous inclusion in the Constitution. Harry Daniels at a press conference in Ottawa in January 1998. 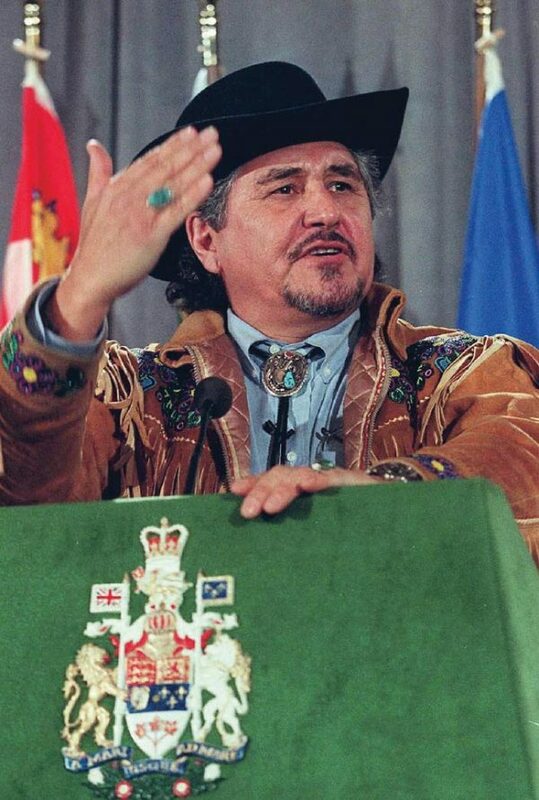 Indigenous leaders such as Harry Daniels (1940-2004), former president of the Native Council of Canada, which represented Métis and non-status Indians, began a campaign in Canada and in the United Kingdom (where the vote would be held to patriate the Canadian Constitution) to ensure that Indigenous Peoples would have their inherent Indigenous rights enshrined in the new Constitution. Daniels wrote extensively on why the Métis and non-status Indians should have their Indigenous rights affirmed. He also lobbied premiers, federal government ministers and British parliamentarians to ensure that the Métis were included in the new Constitution. Governments were at first unwilling to concede any rights to the Métis, but in early 1981, the federal government agreed to hold talks with Indigenous leaders to enshrine Indigenous rights in the patriated Constitution. The Métis’ constitutional status changed in 1982 when Daniels successfully led an effort to include the Métis as one of Canada’s Aboriginal Peoples in the Constitution Act. Section 35(2) lists the Aboriginal Peoples of Canada as Indian, Inuit and Métis while guaranteeing the “existing Aboriginal and treaty rights” of Canada’s Indigenous Peoples. Daniels shares with Louis Riel the distinction of putting the Métis in the Constitution (in Riel’s case, through the Manitoba Act). For many years, the Métis were caught in a jurisdictional limbo — neither the federal government nor the provinces claimed them as their responsibility. Following the patriation of the Constitution, the first ministers and Indigenous leaders were obligated to hold constitutional conferences to further flesh out Indigenous rights within the Constitution. Daniels was involved in these talks, which ultimately failed. Canada’s first ministers were not committed to expanding Indigenous rights in the Constitution. The Métis Nation Accord within the failed Charlottetown Accord would have expanded the Métis’ Indigenous rights considerably. However, a national referendum in 1992 killed that proposed addition to the Constitution. The Métis would later see their Indigenous rights reaffirmed and expanded with Supreme Court rulings, such as the Powley case (2003) and the Daniels case (2016). The landmark 2003 Supreme Court Decision in R. V. Powley forever transformed the Métis’ Indigenous harvesting rights. 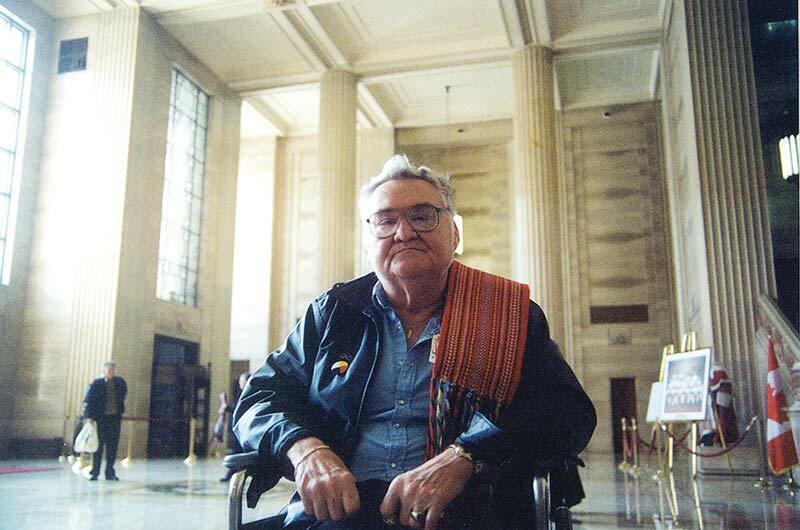 Steve Powley (1948-2004) was a humble man who witnessed his case win at the Supreme Court but passed away before he could see the ruling’s impact on Métis case law. On Oct. 22, 1993, two Métis men, Steve and Roddy Powley, killed a bull moose near Sault Ste. Marie, Ont. They used a Métis card as a tag with a note that read, “Harvesting my meat for the winter.” They were charged with hunting without a licence, a contravention of Ontario’s Game and Fish Act. The Powleys argued at trial in the Provincial Court of Ontario that they had a Section 35 Aboriginal right to hunt. In particular, being Métis, they were asserting their Aboriginal rights while hunting, which predated Canada’s claim to sovereignty. The Powleys had been Indigenous residents of the Sault Ste. Marie region long before Euro-Settlers arrived. The court agreed, as did the Court of Appeal for Ontario. Steve Powley at the Supreme Court of Canada in September 2003. On appeal in R. v. Powley (Sept. 19, 2003), the Supreme Court declared that the Métis respondents, Steve and Roddy Powley, had an Aboriginal right to hunt through Section 35 of the Constitution. The court provided a “test” for Métis communities and individuals for claiming Aboriginal rights under Section 35 of the Constitution, to hunt and harvest as their ancestors had done. To be considered Métis for the Powley test, the claimant or community must self-identify as Métis, have family ties to a historic Métis community in which the “harvesting” of resources occurs, prove that harvesting occurred prior to effective European control, prove that the practice was integral to claimant’s distinct culture, demonstrate continuity between practice and contemporary right and be recognized as Métis by a contemporary Métis community (with ties to a historic community). Harry Daniels, Métis leader from Saskatchewan and former president of the Native Council of Canada and its successor organization, the Congress of Aboriginal Peoples, contributed more to Métis rights than anyone else in contemporary Canada. In 1982, he was largely responsible for ensuring that the Métis would be recognized as one of Canada’s three Aboriginal peoples in the newly patriated Canadian Constitution. However, he believed that constitutional recognition was only a first step to ensuring that the Métis (and non-status Indians) would receive their full rights as Indigenous Peoples. In 1999, he launched a case on behalf of the Congress of Aboriginal Peoples for Métis and non-status Indians who wanted the federal government to claim jurisdictional responsibility for their respective communities. The case would focus on the jurisdictional relationship between Métis and non-status Indians and the federal government through section 91 (24) of the Constitution Act, 1867. When filing with the court, the plaintiffs (Harry Daniels, Gabriel Daniels, Leah Gardner, Terry Joudrey and the Congress of Aboriginal Peoples) asked the court for three declarations to determine the federal government’s relationship with Métis and non-status Indians. These were (1) that Métis and non-status Indians fall within section 91 (24) of the Constitution Act, 1867, (2) that the federal Crown has a fiduciary obligation to Métis and non-status Indians and (3) that the federal government must ensure that the Métis and non-status Indians are consulted and negotiated in good faith and that the Métis and non-status Indians have the right to choose their representatives. In January 2013, the case reached the Federal Court of Canada trial division. In Daniels v. Canada, the court ruled that Métis and non-status Indians are “Indians” for the purposes of section 91 (24) of the Constitution, and they fall under the federal government’s jurisdiction. On April 17, 2014, non-status Indians were removed from the 2013 Daniels ruling on appeal. On April 14, 2016, the Supreme Court upheld the earlier Federal Court ruling that established that the Métis and Non-Status Indians are “Indians” for the purposes of Section 91 (24). Many Métis activists and academics argue that by not tying Métis identity to a specific nation of Indigenous people with a history or territory, the court erred. This ruling ended the jurisdictional limbo in which neither the federal nor provincial governments claimed jurisdictional responsibility for the Métis. In particular, the justices argued that throughout the history of Confederation, various federal governments claimed that the Métis were “Indians” when it suited them but denied this at other times when it was less convenient. Moreover, the court declared that when the provinces provided services or rights to the Métis as an Indigenous people they could continue to do so. The fallout from the Daniels case was immediate. Many erroneously claimed the ruling would provide Métis with the same rights and benefits as Status Indians. The ruling was, in fact, about determining federal responsibility for Métis and non-status Indians through Section 91(24). It did not claim that Métis and non-status Indians would fall under the Indian Act, 1876. Any rights granted to the Métis via Section 91(24) would have to be negotiated with the federal government or Crown, which had a fiduciary obligation to act in the Métis’ best interests. This could mean years of further litigation. The ruling is also not specifically tied to Section 35 of the Constitution Act, 1982, which relates to the Indigenous rights of First Nations, Inuit and Métis. On April 15, 1981, the Manitoba Métis Federation was joined by the Native Council of Canada in a major claims suit against the federal and Manitoba governments. In this case, the MMF sought a declaration that certain pieces of provincial and federal legislation that amended provisions of the Manitoba Act are unconstitutional. If proven in court, the MMF could proceed with another case seeking compensation for the losses the Manitoba Métis suffered as a result of the governments’ unconstitutional activities. The case was heard in court in January 1987. The federal government argued that the case should be dismissed since the matter was settled in 1870. In February 1987, a Manitoba court ruled in favour of the MMF, but the federal government appealed and the case went to the Manitoba Court of Appeal, which in a majority decision agreed that it should be struck. In 1990, the Supreme Court affirmed that the MMF had a right to seek a declaration that the federal and provincial governments had unconstitutionally undermined the Métis’ rights conferred by sections 31 and 32 of the Manitoba Act, 1870. By ruling that the government had failed to meet its fiduciary obligation to the Manitoba Métis, the Supreme Court confirmed the MMF’s standing in a collective claim for declaratory relief in order to have reconciliation between the descendants of the displaced Red River Métis and Canada. The case was not a land claim in the traditional sense. Since the lands in question represent present-day Winnipeg and the surrounding area, the MMF was not seeking to displace people living there, but rather seeking a land base elsewhere in the province as well as financial compensation. The Supreme Court did not list the amount of compensation, but left that open to the MMF and the federal government to settle the matter. …the unfinished business of reconciliation of the Métis people with Canadian sovereignty is a matter of national and constitutional import.